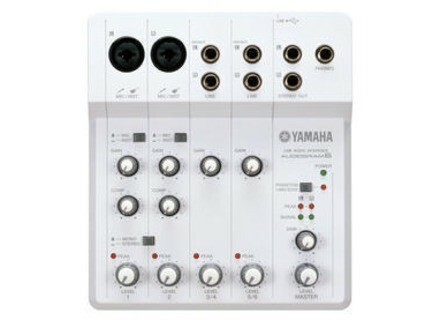 Audiogram 6, FireWire/USB/mLan Mixer from Yamaha. The AUDIOGRAM Series bundle together a hardware interface with audio inputs and outputs, software for recording and producing music, and a USB cable for connection to a computer. Recording music from instruments, microphones, CD players or MP3 players is as easy as installing the included music-production application, CUBASE AI, on your computer and connecting the audio interface using the USB cable provided. "The AUDIOGRAM Series has been carefully designed to make everything from set-up to recording as easy as possible," said Athan Billias, Director of Marketing — Technology Products for Yamaha Corporation of America. "With USB powered hardware that automatically recognizes the included Cubase AI software, computer music production is now accessible to virtually anyone." The AUDIOGRAM 6 features 2 XLR combo inputs with preamps and one-knob compression for dialing in the desired sound from microphones and instruments. 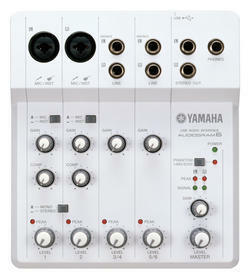 One of these inputs has switchable phantom power for using high-quality condenser microphones. Two stereo inputs, stereo and headphone outputs, and a USB jack complete the unit's connections. The AUDIOGRAM 6 includes separate controls for audio inputs and computer playback . The AUDIOGRAM 3 features one phantom powered combo input switchable for microphones or instrument recording, a stereo input, a stereo and headphone output as well as a USB jack for connection to the computer. The AUDIOGRAM Series will be available in August, 2008 for $139.99 retail (AUDIOGRAM 3) and $199.99 retail (AUDIOGRAM 6).